Everyone knows that Toronto is a beautiful city to explore, but it can often cost you a pretty penny doing it. Whether you’re a local looking to save some cash or a tourist looking to wander the city for a day, here are 15 things to do while on a budget in Toronto this fall! 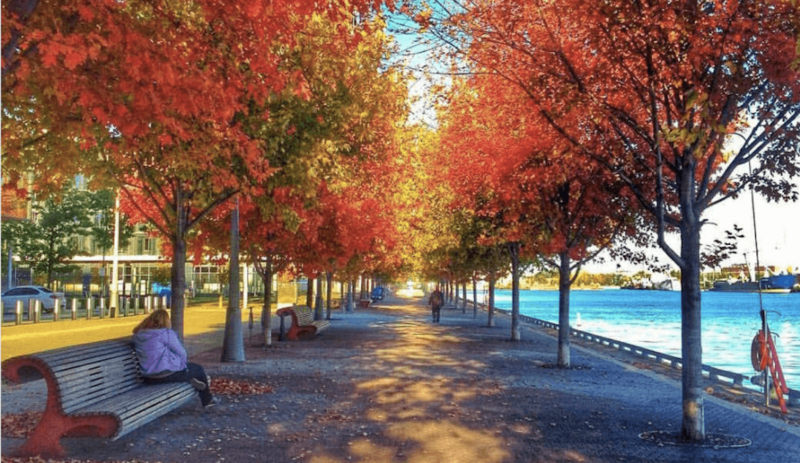 Visit Harbourfront Centre this fall and take a scenic walk along the waterfront. You can check out their fall visual arts exhibitions that run until December 24 and are completely free, go for a skate in November when the rink opens, or check out local events coming up at the venue. While you’re at Harbourfront Centre, check out a magical place known as Toronto Music Garden. Designed by renowned cellist Yo Yo Ma alongside landscape designer Julie Moir Messervy, the garden has no admission fee and it’s beauty is definitely something you just gotta see for yourself! There’s something about being outdoors in the fall – the leaves start to change colour, the air is crisp. So immerse yourself in the great outdoors by heading to Riverdale Farm this fall. Located in Cabbagetown, you can spend the afternoon visiting with the farm animals, take a tour of the grounds or go on a hike through the wooded areas. Get lost for a few hours – quite literally. Try heading to the Toronto Islands and spend some time testing your navigational skills in the William Meany Maze. While you’re there you can also rent a bicycle, pack a picnic lunch and just enjoy the beautiful views! #Repost @nightswimmingth ・・・ In rehearsal for the @nightswimmingth production of The Fish Eyes Trilogy by @anita_majumdar at @factorytheatre in Toronto. https://www.factorytheatre.ca/2017-18-season/the-fish-eyes-trilogy/ #torontotheatre #doraawards2017. Thanks @ypttoronto and @banffcentre! Spend Tuesday night at the local theatre. Factory Theatre has been around since 1970 and specifically features Canadian plays. On Tuesday’s you can line up for their ‘toonie tuesday’ preview night special. Tickets go on sale starting at 5 pm the day of show on a first come first serve basis. Head down to the South-East corner of Yonge and Dundas Street and check out one of the many events happening weekly. Coming up in October the public square will have a Google Home Mini Donut Shop set up, and a Sketchers Canada JUST DANCE event. Catch a show -and a few laughs – at the Comedy Bar this fall, with multiple shows happening nightly. Tickets range from $5 up to $20 depending on the performer and features acts like improv, sketch, alternative and stand-up. Located in the Beaches neighbourhood in Toronto, Fox Theatre has been around since 1914 and is the perfect place to go for some old school nostalgia. This independent cinema features contemporary, classics and cult films, along with having a fully licensed bar serving craft beer, cider and wine. Members get in for only $8 a ticket and non-members are $11. The amazing nature of Canada… I love it. Picture a blur of red, green and yellow surrounding you and the sound of the city just fading away. Slow down the daily grind by exploring nature for a few hours in High Park. The park features 161 hectares of green space and is known to be exceptionally beautiful during the autumn months. Take a stroll through Kensington Market this fall and get lost in the charm of this unique bohemian neighbourhood. Regardless of your cash flow, you’ll find lots to do with indie shops, boutiques, specialty grocers, and quaint cafes on every corner. Go exploring at the St. Lawrence Market with over 120 vendors including artisans, bakers, butchers and more. There is also a farmers market with fresh local produce on Saturdays, along with an antique market on Sundays. Spend a few hours walking in the pedestrian-only Distillery District in Toronto. Take in the 19th century buildings, wander along the cobblestone streets, marvel at the outdoor sculptures, or venture into the many shops and cafes. It’s also home to the famous ‘love lock’ sign – for all the lovers out there. Visit the Art Gallery of Ontario on Wednesday nights and you’ll get in for free! It has been a tradition with the gallery for awhile now, they allow free access to all their collection galleries between 6 – 9 pm. If you’re short on cash, and looking for your next great Instagram post, Graffiti Alley is where it’s at. Also referred to as Rush Lane, you can wander the street while taking in all the beautiful yet eclectic artwork that just seems to go on and on. Freshen up on your history of Toronto and enjoy a brewery tour at Henderson Brewing Company. The tours are free, and for only $5 you can also sample a few of their signature brews on tap. Lifestyle contributor for Daily Hive. Lover of dogs, coffee, yoga and all things celebrity gossip. Toronto is home, but Vancity has my heart.